A travel adventure to most people means a climbing expedition, a safari or similar experience. Mine was much more modest – and economical. Needing a one-way ticket from Cleveland, Ohio, to Portland, Oregon, I decided to “Ride with the Dog” – the Greyhound Bus. Armed with reading material, a notebook, an MP3 player loaded with podcasts and realistic expectations, I checked in at the downtown terminal. Right away I noticed the folks waiting inside seemed better off than those I’d seen loitering outside almost every time I’d driven past. There was a mix of black, brown and white passengers; young and middle-aged; male and female. This diversity would hold true throughout my trip. Then, a stern voice: “Come over here!” A male employee was scolding two young men who’d been standing outside in the boarding area. “I’ll show you where you smoke!” The “good cop, bad cop” pattern in Greyhound personnel also would hold true. No matter. Carry-on bags aren’t the time savers they are for air travel anyway. You needn’t worry about losing luggage, either. You can watch your bags being loaded and unloaded. When you change buses, in fact, you’re required to take them with you. A driver obligingly retrieved my bag from the storage area during one of the longer stops. When I reboarded, he stowed it along with the new passengers’ bags. A word about reboarding. Ask the driver for a pass during stopovers at downtown Greyhound terminals so that you’ll be able to reboard ahead of any new passengers. Two exchange students didn’t understand this and wound up at the end of the line of new passengers who quickly took up the remaining seats, leaving the students to take another bus. Don’t confuse reboarding with changing buses. Whenever you change buses, you become a new passenger and must wait for reboarders to take their seats. On my very first change I dawdled before getting in line for the next bus. It filled up and I had to wait an hour for another bus. But it proved a blessing in disguise. The extra hour I spent in the not-so-bad Columbus terminal was one less hour I would spend in the ancient, tiny, depressing St. Louis terminal. The overflow bus also had more room. Rule #1: Always, always sit as far toward the front as you can. Anybody bent on getting high or otherwise screwing around generally heads toward the back of the bus, far away from the driver. Rule #2: Keeping in mind Rule #1, look for an empty row and take the aisle seat. Subsequent boarders will pass you up looking for an empty row or at least a seat on the aisle. Most people seem reluctant to step over someone to take an available window seat unless they must. You may wind up with the row all to yourself. Rule #3: If the bus seems to be filling up, examine the line of passengers yet to board. See that thin, fairly benign-looking person? That’s your seat mate. If you try to hoard the last empty seat for your own comfort, you may wind up with a large companion who overflows into your space. Rule #3-A: Before anyone – especially a big anyone – joins you in the row, make sure the arm rest separating the seats is firmly in place and lean on it to keep it that way. It may not preserve your leg room, but you’ll feel less like a Siamese twin joined at the hip. Beyond selecting a seat mate, studying my fellow passengers proved very interesting. My initial thought was that they’d been sent over by Central Casting. There was the 50ish woman who reminded me of a faded Anne Bancroft, reading a decrepit paperback she might have found in a trash barrel. A younger man with staring eyes boarded with matched luggage — two pillow cases stuffed with clothes. 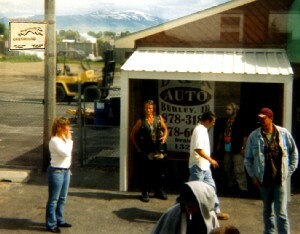 An aging biker decked out in chaps and a leather vest carrying what looked like a Native American’s ceremonial staff made straight for the back of the bus, along with a guy carrying a drum and a young woman who would take up with one male passenger after another. One man reminded me of the big kid in the Goonies. Several more could have been extras in your average possessed-by-aliens crowd scene. But before my sense of superiority could swell too much, I began to notice something else: a kind of human interaction one rarely if ever sees during air travel. At a meal stop a man dressed like a laborer watched the exchange students hesitating at a fast food counter. When they didn’t order anything he asked in a low voice, “Do you have money for food?” (I’m sure they had more than he.) At another break a young man of color offered me some of his fries. In one terminal the scary looking “Goonie” amiably explained the reboarding protocol to a newbie. It was the first time I was ever mistaken for a vagrant but I appreciated his watchfulness. Your average Greyhound terminal isn’t located in the best part of town. Visible security is welcome. Back on the bus, keeping order is up to the drivers and the drivers are more than up to the task. Our very first driver, after reciting the “Miranda warning” against cigarettes / drugs / alcohol, added, “If you have a question for the driver, do not approach past the first 2 rows … Now, are there any questions?” There were none. Frankly, as far as Greyhound drivers go, I prefer “bad cop” over good. One friendly grandfather type seemed to lose authority at his first stop, a two-minute passenger drop-off, when he permitted a smoke break “– as long as you stay by the side of the bus.” Right! Several promptly made for the store some distance away. “I didn’t have to give you that break,” he whined as we finally continued our journey. “I’ll probably have to cut our next one 5 minutes short.” Later, after the Nymph tried to get her latest companion to carry her onto the bus piggy-back (only she was straddling him from the front), Gramps’ voice crackled over the intercom: “I think some of you may have been drinking. You may want to stop or you may fail the breathalyzer test at the next station.” It was clear to everyone that all he really wanted to do was finish his shift. The other drivers demonstrated much more command, in particular a crusty veteran who drove us through a series of whistle stops. At one of these he got off to stow away a new passenger’s baggage, only to look back as some of the smokers began to climb down behind him. A few of the drivers introduced themselves and a couple thanked us for riding Greyhound. One even called out the classic, “All ‘board!” Another said, “Sit back and enjoy the ride. I’ll get your there safely.” The lone woman driver was probably the most thorough in her announcements and an Asian man was the most creative. “I want to tell you the story of Rock Springs,” he began, as we neared a meal stop in Wyoming. I settled back, anticipating a tale of some prospector who swung his pick and out came water. But, no. No more than 25 minutes later, everyone had returned to the bus. Smiling, the driver maneuvered onto the Interstate as we gazed out the window imagining the poor souls marooned in Rock Springs. “Before you exit, please look to your right and left, under your seat and in the overhead rack. If you leave something on the bus don’t worry about it,” he reassured us, “because you’ll never see it again! “You’re welcome,” I thought. Except for the occasional seatmate squeeze, the coaches were comfortable and the ride smooth enough for reading and writing. The large windows offered a panoramic view that turned the otherwise mind-numbing Interstate into a scenic experience. I mostly enjoyed the passengers, especially the exchange students, a young Latino family – and Anne Bancroft. I wouldn’t be averse to “riding with the Dog” again. After all, it’s a good way to see the “real America” – and there are no live chickens on board. The Arnold Arboretum of Harvard University is the oldest public arboretum in North America and one of the world’s leading centers for the study of plants. 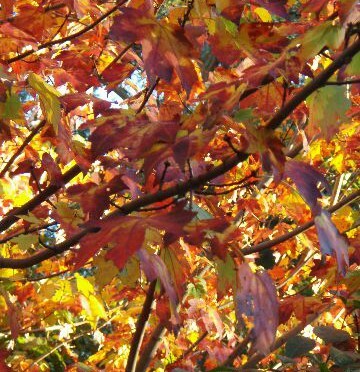 A unique blend of beloved public landscape and respected research institution, we provide and support world-class research, horticulture and education programs that foster the understanding, appreciation and preservation of trees. The Sandinista revolution is perhaps what most people think about when they think of Nicaragua. But as with so many other Central American countries, Nicaragua is a place rich with culture, sites, and opportunity for tourists. With the help of the World Bank and the International Monetary Fund, the country has been trying to recover from the ravages of war, but this recovery has been made harder by inflation and high unemployment. Still, Nicaragua has been dealing with the problems of the past and as success arrives, more and more people are making there way to this country–but there is still a lot of work to do. Some areas of Nicaragua remain unstable, run by armed criminal groups. This is particularly true along the northern border near Honduras; but if you are traveling to Nicaragua, it’s wise to be cautious no matter where you are. The capital, Managua, is set on the southern shore of Lago de Managua. Over the years this city has been devastated by natural disasters, and since the earthquake of 1972, Managua has had virtually no city center. However, construction is underway, and the city continues to improve its facilities and restore attractions. But the line between those who have and those who have not remains distinct–poverty is a very real problem in Managua. Granada is oldest Spanish city in Nicaragua. Founded in 1524 by conquistadores, it rests on shores of Lake Nicaragua in the shadow of Volcán Mombacho. The town is a literary center and has a quiet, historic feel. It’s an ideal city to tour on foot, and when you’re ready to take a break from seeing Granada’s colonial sites, the lake is just a short walk from downtown. Down the Río Escondido from Managua, Bluefields is an ethnically diverse area on the Caribbean coast and an interesting and fun place to visit from the tourists’ point of view. The people of Bluefields know how to have a good time: there are several reggae clubs and dancing on the weekends. While several overland and over-river border crossings exist between Nicaragua, Honduras, and Costa Rica, the major airlines fly regularly into Managua from Europe, North America, and other Central American countries. For the U.K., U.S., E.U. member countries, several other Latin American countries, Scandinavian countries, and more, visas are not required to enter Nicaragua. Tourist cards good for a 90-day visit will cost a small fee at arrival, and an exit tax is charged upon leaving the country. Travelers from Canada, Australia, New Zealand, and other countries that do not have a reciprocal relationship with Nicaragua will need a 30-day visa to enter the country. Budget travel in Nicaragua can be done for US$10-$20 a day, but for US$30-$40, you can enjoy an occasional rental car and meals at more upscale restaurants. US$40 and more will allow for very comfortable travel. Tipping is not a common practice in inexpensive restaurants, but 10% is the norm for more expensive eateries. There is a nationwide value tax added to each bill, and occasionally a gratuity will also be included, so be sure to check for the latter before leaving an extra tip. Haggling in open marketplaces is a common practice. Domestic airlines fly to the major hubs such as Managua, Bluefields, Puerto Cabezas, and the Corn Islands, but if you are heading to places more remote, the bus is your best option. Buses run on a regular schedule, but be be wary of pickpockets and thiefs, who often turn to the buses to find unsuspecting victims. Make sure to keep an eye on your luggage and don’t keep anything of value in your pockets. Boats are sometimes the only way to get to places on the two coasts, especially on the Caribbean side, but this can also be the most expensive way to travel. On the Pacific coast and toward the center of the country the best time to visit is early in the dry season–December to January. Temperatures are cooler and these areas are very lush during this time of year (the Caribbean coast is predominantly rainforest, that is, green and lush year round). However, Nicaragua is a nice place to visit almost anytime of year, with the possible exception of the end of the dry season–April and May–when the climate is much more arid. Perhaps it was the wild boar on the menu that gave it away. Or the way the chef emerged excitedly from the kitchen, white uniform tight and stained, to chat with us after he heard foreigners in the house. The restaurant, and in fact the whole town of Tende, was devoid of pretension and decidedly un-French. Somehow, the unrefined game animal, which may have been tromping through the forest that cloaked the valley below just the day before, found its way onto the menu next to the fromage and paté. We were two travelers passing through, just looking around for somewhere interesting during the late autumn lull so common to mountain towns before the snow falls. Seated in what may be France’s only existing non-smoking area, we were studying the menu when the chef brought a wood plaque with an old 1992 Boston Globe article mounted on it. It was a review of his restaurant, and quite clearly the showpiece of the place. He clasped his hands together underneath his protruding belly and beamed as we read. Such a welcome from the French was unusual. We had just driven up along the French-Italian border from Nice and the Riviera, where waiters corrected our grammar and shopkeepers could not be bothered to utter a merci. Conversely, Tende seemed eerily pleased with our presence. For a moment we thought we had unknowingly exited France, and slipped over the border into the care of French-speaking Italians. Somehow this anomaly town called Tende, like the wild boar, had wound up on our plate. Nestled between the high Alps and the balmy Mediterranean shores, Tende sits like a fickle queen at the head of the Roya Valley, not committing to either climate or culture. The icy Tende river swirls through the town and meets the warm Mediterranean Sea only 40 kilometers away. In autumn, the town is ringed by 2000-meter peaks dusted with snow while stands of larch trees and pine decorate its flanks. The smell of toasty household fires belies the sight of perky reds and purples in flower boxes outside. Tende’s cultural duality unfurled as we strolled through town. The cemetery´s headstones read both Bertrand and Cacciardo. The living still greet one another with ciaos and bonjours. The postman delivers all of the 2,000 residents’ mail on foot, and squeezes copies of Le Figaro magazine in tiny mail slots of homes hundreds of years old. 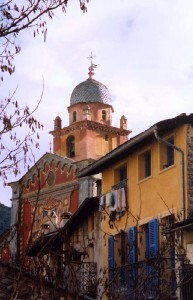 These dwellings, many of which are approached only by meter-wide passageways, encircle the pink Gothic church of Tende. Inside the church, signs in French and Italian ask you to be quiet. Not that there would be much yukking it up at this time of the year—the autumn silence of Tende is broken only by the hourly bong of the clock tower. Sundials on the sides of buildings were quieter reminders of time, but of time that passed slowly and deliciously. I imagined one hundred years from now you could still peer in dusty windows of medieval edifices and dip your bucket in the community water fountain. You could get lost in the labyrinth of cobblestone backstreet’s, but then get pointed gently in the right direction. I sensed the old women would forever shuffle along unhurriedly, waving at virtually every car that drove past, and stopping occasionally to chat with its occupants and double kiss their cheeks. Shopping in Tende continued in the traditional fashion; it meant separate visits to the boulangerie, charcuterie, and patisserie, for bread, meat and pastries. The store hours ensured a lengthy lunch and a healthy afternoon nap. Not surprisingly, this little French town does indeed have its roots in Italy. When the House of Savoie absorbed Tende in 1581, the town became a crucial stop on the Salt Route between Nice and Turin. 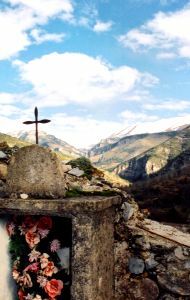 When the communes of Savoie were rejoined to France in 1860, the residents of Tende were still French speaking and wanted to be included in the reunion. Deaf to their pleas, Napoleon III snubbed the town and left it to Italy. Tende, along with the Roya Valley, was the preferred hunting ground of Italian royalty and presumably their source for tasty wild boar. It wasn’t until 1947 that the peace treaty between the two countries allowed Tende back into France. Perhaps after Napolean’s rejection, Tende vowed never to become wholly French. Not once were we expected to wear flashy clothes, given wrong directions, or seated next to a middle-aged woman cooing to her dog at the dinner table. No one ridiculed our butchered French. Instead, our hotel owner was concerned if we were comfy, store clerks asked if they could help, and restaurant staff treated us like prized patrons with discriminating tastes. Tende was France as we wanted it to be. That’s not to say it is undiscovered. In the summer, tourists flock to Tende to access the adjacent Mercantour National Park to picnic, hike and gawk at over 36,000 petroglyph’s from the Bronze Age. Tucked away in the park’s Vallee des Merveilles, or Valley of Marvels, the petroglyph’s attest to the movement of people through the area thousands of years ago as well. Although most of the stone etchings are the garden-variety spirals and cows, one petroglyph in particular commands attention and still lingers in mystery. Dubbed The Sorcerer, it was found on a rock slab at the base of Mt. Bego, and it depicts a human figure whose arms appear to be lightning bolts. Archaeologists are baffled by the meaning of this mysterious figure that in no way relates to the others. Is it a shaman, a god, a sign of the supernatural? Our hotel owner, Francoise, had a giant print of The Sorcerer hanging in her dining room. She had her own interpretation of its meaning. For centuries, Mt. Bego has attracted violent storms, she said. Ancient people saw this and they were afraid of the mountain’s powers and declared the mountain a sacred site. Then they carved a warning in stone. Now preserved in Tende’s surprisingly sophisticated Merveilles museum, visitors are left to wonder what story The Sorcerer is telling in stone. These days locals tell their stories at the bar. We stepped into one which also fronted as a café. Old men were clustered around a counter, slurping strong coffee and smoking, slapping one another on the back, and waving their arms in feigned arguments. Their tanned gnarled hands spoke of Mediterranean sunshine and hard mountain work. Outside, a single crumbling spire that looms over the town tells the best story of Tende’s political tug of war. It is all that remains of a grand 14th-century French château which was ordered by the Italian king to be destroyed in 1692. 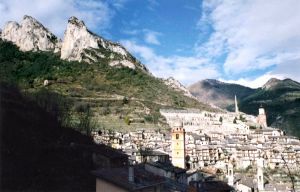 Tende’s residents, then under the rule of Italy but still allegiant to France, refused to demolish it. Consequently, the town’s neighbors took it upon themselves to bring the château to the ground. As we finished our wild boar, the pleasant wife of our chef wiped the counter slowly and chatted with us, lamenting that Tende is still being pushed around. The town is still relatively ignored, she said, and lives in the shadows of its resort-town sisters like Nice and Chamonix. She sighed and rested her chin in her hand, saying it is the lack of employment in Tende and attraction of the urban areas that draws the young people away. We had to agree. Tende could be a youth’s nightmare: a home town locked in time, devoid of the dynamism so prevalent in neighboring cities. Yet for us, it was a lucky find. This town took us in like it was welcoming its children back home.